YouTestMe GetCertified can automatically generate an unlimited number of unique tests based on predefined criteria. Each test can be associated with the attractive looking certificate which will be awarded to the user upon successful test completion. 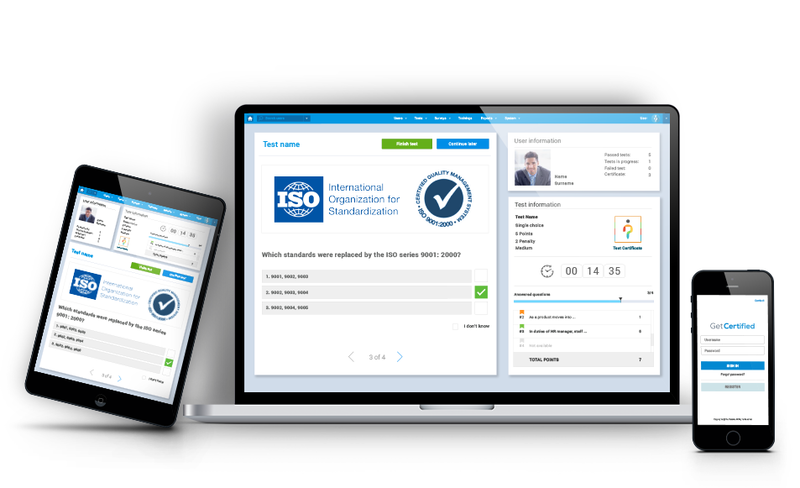 YouTestMe GetCertified is an excellent solution for step-by-step training and employee compliance training. Use the Training Module to create and customize each step of your users’ learning experience. You can attach an unlimited number of multimedia learning materials to your lessons. Tests can be added at the end of the part and/or the end of the complete learning session. 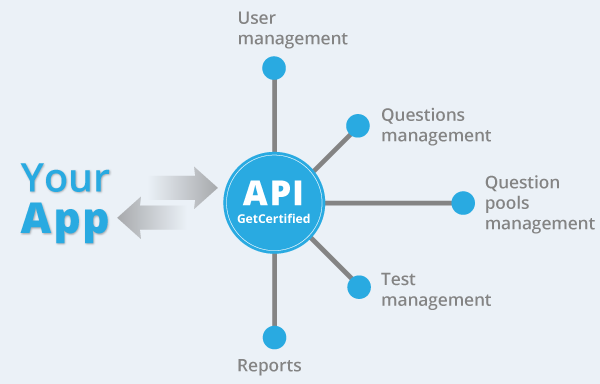 YouTestMe GetCertified simplifies the user management process, still giving you the maximum flexibility for configuration of user profiles, user roles and data. Create your tests efficiently with YouTestMe GetCertified’s test generator, export them to a print-ready PDF and distribute them to candidates via email or in a paper form. YouTestMe GetCertified can also generate answer keys, which can help you quickly evaluate paper-based tests. Email templates are used if you want to notify some user of some changes in the system (for example send user his username and password, changes about username and password, information about registration, about courses, about profiles..). These email templates are pre-defined. Now you can define your own text for some email templates. 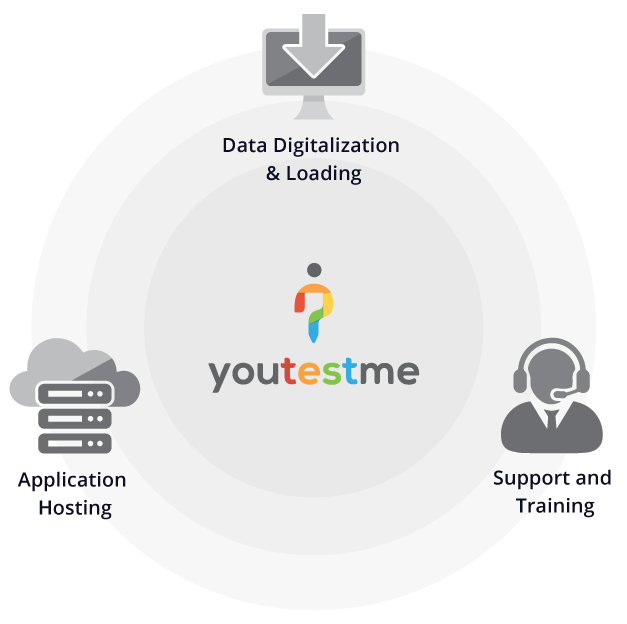 YouTestMe GetCertified is a complete solution for creating, selling and delivering online knowledge tests, surveys and training courses. Our software has a user-friendly interface, and it`s easy for your customers to browse, preview and purchase content. 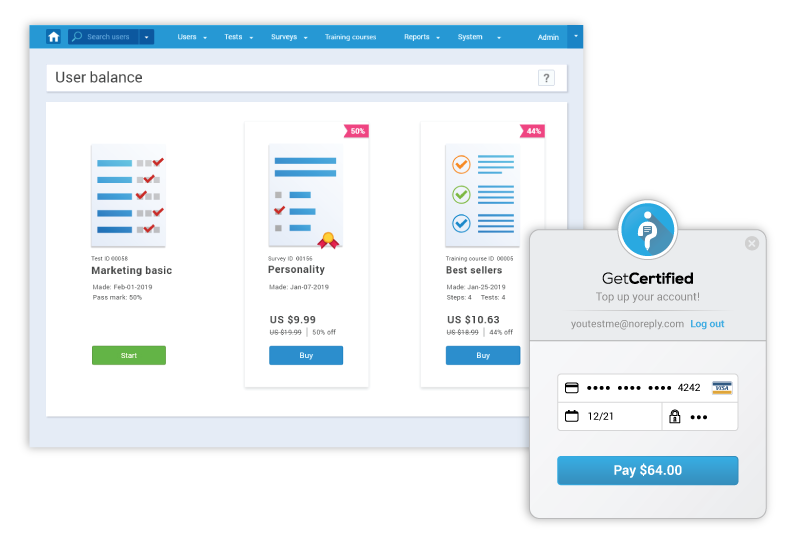 YouTestMe GetCertified supports payments with credit and debit cards. With our API you can easily integrate your systems with YouTestMe GetCertified. You can programmatically access a wide range of functions and data from YouTestMe database. NOTE: This solution is available exclusively for YouTestMe Cloud version. 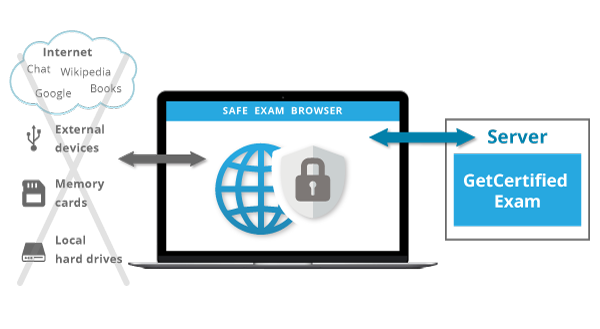 YouTestMe GetCertified supports taking tests through a Safe Exam Browser (SEB). 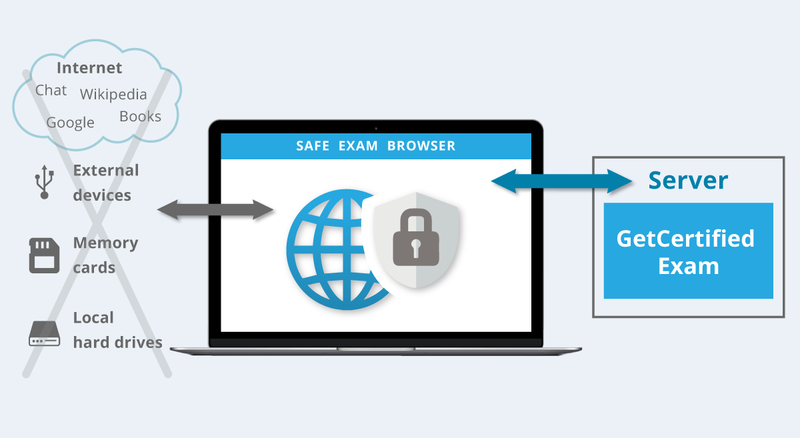 SEB changes any computer into a secure workstation, disabling all system functions, applications or websites, as well as the access to resources that could be used for exam cheating, thus creating a secure exam environment. You didn't find everything you were looking for? YouTestMe GetCertified online exam and certification software is easily customizable and can be integrated with other systems. Contact us with your specific requirements. We can save you significant time and effort by preloading the purchased products with your data and provide you with a ready-to-use system. If your data is in paper format, we can digitalize it and load it into YouTestMe GetCertified. We offer a secure hosting of YouTestMe products on our Cloud servers. Our servers are located in Canada and France. In addition to the standard training package (product documentation and video tutorials), we offer live training sessions using: Cisco WebEx, Skype, and Personal Administrator. On-site visits and one-to-one training and assistance is also an option. Our Support team will be happy to arrange live presentations and training session for you and your staff. Please contact us for more information. YouTestMe GetCertified has more than 100 features. See all features or go through our help system. A basic introduction to the main features of GetCertified. User organization and user management. Question types and how they are organized. Training courses and how they are organized. Test management, certificates and test questions. Survey management, profiling and survey questions. System and custom reports and statistics. List of all features in GetCertified.